Something fishy’s going on at the NMDC these schools holidays. That’s because of our ‘fintastic’ new interactive fishing game. With its fun format and its educational content about managing fisheries, we reckon you’ll be falling for it hook, line and sinker! Discover the Truth About Sharks when you join our guides at the touch table to investigate various shark artefacts including shark jaws, teeth, skin and shark eggs, and learn why some sharks don’t deserve the fierce man-eating reputation. 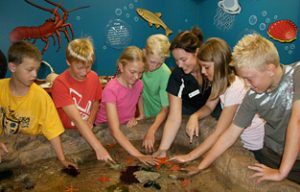 And why not book into one of our fun-filled school holiday activities such as Sea Monkeys Rock, which offers the opportunity of making your own sea monkey hatchery or create your own 2010 ocean-themed calendar in A Year with the Ocean. What has eleven pairs of legs, three eyes and breathes through its feet? A sea monkey, of course! Discover why sea monkeys rock and take your new pets home with you! Bookings are essential for our special school holiday activities, so please call 9203 0339 to reserve your place. Cost includes entry into the NMDC.